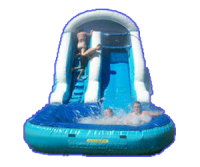 Our 14ft Tsunami inflatable dry slide is great for parties or get togethers and you don’t want the kids to get wet. The pool liner is removed and underneath is an inflatable mattress that the kids slide into. Kids love this slide and will have hours of fun. Kids tend to sit at the top and pretend it’s their personal fort. The dry inflatable slides are a great hit in the cooler months here in Florida. Check out our Dry Combos for a Bounce House and Slide Combos. Have the best of both worlds. Click the “Reserve Now” button above to get a Quote or to Reserve/Book online.